"What were you dreaming about?" 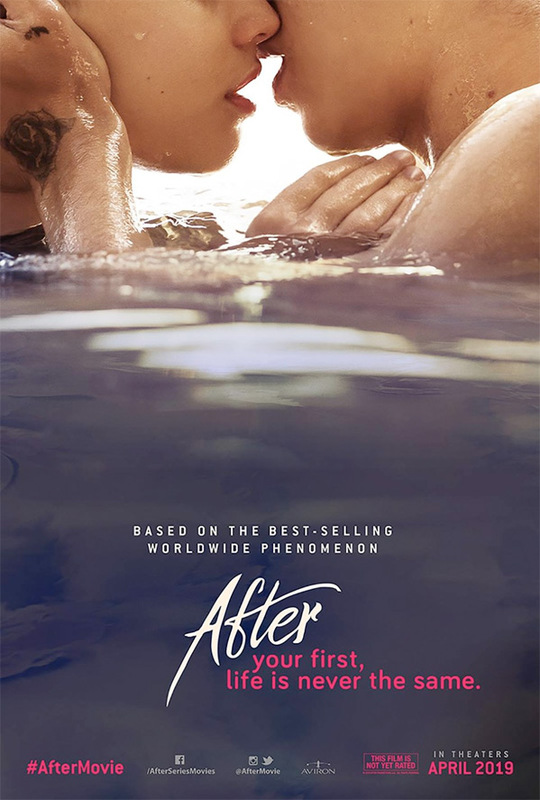 Aviron Pictures has released the first teaser trailer for a new romantic drama titled After, the latest passionate young lovers film adapted from a popular YA series. Josephine Langford stars as Tessa, a teenager who falls for Hero Fiennes Tiffin as Hardin, a guy with a dark secret - and the two embark on a rocky and "dangerous" relationship. Inspired by the music and fandom of One Direction, Anna Todd began writing her stories as a hobby using her phone with the Wattpad app in 2013, publishing a chapter almost daily for over a year. After rapidly gained reads on Wattpad to become the most read series on the platform. The cast of After includes Jennifer Beals, Selma Blair, Peter Gallagher, Meadow Williams, Inanna Sarkis, Samuel Larsen, Pia Mia, and Dylan Arnold. I'm not sure what makes this unique, looks like pretty much every other sultry teen romance before it. Maybe I'm too old now. After follows Tessa (Josephine Langford), a dedicated student, dutiful daughter and loyal girlfriend to her high school sweetheart, as she enters her first semester in college. Armed with grand ambitions for her future, her guarded world opens up when she meets the dark and mysterious Hardin Scott (Hero Fiennes Tiffin), a magnetic, brooding rebel who makes her question all she thought she knew about herself and what she wants out of life. After is directed by up-and-coming filmmaker Jenny Gage, now making her narrative directorial debut after first directing the doc All This Panic in 2016 previously. The screenplay is written by Susan McMartin, adapted from Anna Todd's novel of the same name. Aviron will release Jenny Gage's After in theaters everywhere starting April 12th, 2019 in spring. First impression? Who's excited?